Sip something lovely while the sun goes down at an ocean-fronting festivity. Summer Solstice is celebrated a few days early in Del Mar. Meet the longest day of the year ahead of time, with sips, bites, and tunes, on Thursday, June 18. THE DEL MAR VILLAGE SUMMER SOLSTICE... and it brings the bash to Powerhouse Park, which is not all that far from the waves of another P-named thing, the Pacific. 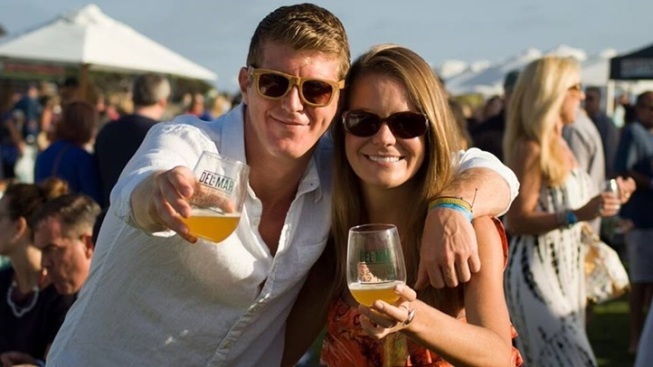 "California's best wineries and breweries" make a showing at the Thursday, June 18 confab, as well as regional makers of delicious foodstuffs including Bull Taco, Zel's Del Mar, Jake's Del Mar, Sbicca, and Ocean View Bar and Grill. The beneficiary is the Del Mar Village Association, and you benefit by getting in deeper with Del Mar's dining options. Only ever stick to one or two places while you're through town? This is your edible education night. Mostly, though, you should find a chilled glass of Chardonnay, that unofficial drink of a 21+ summer, and raise it to the big ball of fire setting to the west. For while a sunshiny holiday only officially comes around but once a year for most places, for we ocean-facing West Coasters acting like every day is the longest, most languid day of the year is sometimes a way of life.